Among Filipinos, “Lola” is used out of respect for an older person, regardless of relation. It is a term of endearment, not a term of enslavement. Still, I was more surprised that Alex Tizon had died in March than that he had a family slave. I didn’t know Alex well, but knew him to be a good reporter and writer. I had been in touch with him when his book, Big Little Man: In Search of My Asian Self, came out. I also knew him to be an immigrant from the Philippines. Alex was trying to come to grips with that as he was becoming more and more American. Me? I was born American, son of immigrants, trying to understand my own Filipinoness. I just never thought slavery was an option, until Alex’s story. Make no mistake: slavery and exploitation of a human being, no matter where it occurs, is immoral and wrong. There is nothing charming about Alex’s story of Eudocia Pulido, the woman whom Alex called “Lola,” and who was enslaved for 56 years as the caretaker of his family in both the Philippines and the U.S.
Where was ICE? Where was the Labor Department? Not looking out for the interests of Eudocia Pulido. Alex talks about her being beaten in the Philippines, exploited both there and in America, and working long hours with little to no pay. Pulido, being from a poor provincial part of the Philippines, saw there were few better options than to be committed to being a family “helper,” albeit for life. Having household help, or maids, is part of Filipino society especially among the elites, or simply those with more dollars than the masses. In the peso world, where 50 pesos make a dollar, labor is cheap and plentiful. A relative of mine retired to Manila with her U.S. pension recently. One of her perks of retirement was having people to clean and cook for her family. But she never referred to her help as slaves. So Alex’s story outlines an abuse, something I can understand given the poverty of the Philippines, where millions of Filipinos seek work overseas, mostly as domestics. In that sense, Alex’s piece is more confessional, of a now-Americanized Filipino returning the ashes of the woman whom his family had called “Lola,” but, in fact, was a human being they had trafficked among themselves. 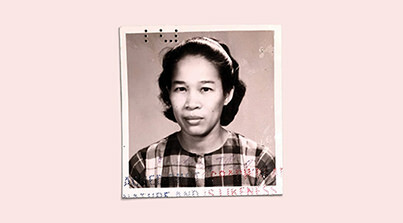 And there’s no excusing the system that allowed the practice to be exported from the Philippines to the U.S.
Lola Pulido had come with papers, overstayed her visa, and became what Filipinos called a TNT–which stands for “tago ng tago,” literally “hiding and hiding”–the apt description for one on the run. It’s a part of that broken system that allows for people to disappear, for abuses to happen, and for tragedies like Lola Pulido. I found it interesting that the reaction to her story has been varied. Some want to throw the book at Alex’s family. But the main perps–Alex’s grandfather, and his own mother and father, have died. Others defend Alex for what his family did, saying it’s a cultural thing. They criticize those in the West for being self-righteously indignant about the treatment of Lola without really understanding the conditions of the Philippines. But there’s no defense for what happened. There’s no way what they did to Lola was acceptable–unless they paid her an hourly wage, overtime, benefits, and vacation. Barring that, it’s exploitation, human trafficking, and, as Alex himself points out, slavery. There’s only one way to see Alex’s story. It’s a journey of personal redemption, not just for what his family did to Lola, but maybe for his own lost sense of Filipinoness as he became Americanized. After centuries of colonization, deferential subservience is in the DNA. That explains Lola, so you know there’s more than one instance out there in both the Philippines and the U.S. The flip side of that is how Filipinos have been, in a small way, too eager to be colonizers themselves. That’s the takeaway of Alex’s story for me. After centuries of Spanish rule, and a few decades under the U.S., Filipinos have shown they are all too willing to exploit each other. The worst aspect of the dehumanization of slavery is when it’s based not on race, but class. Anyone is susceptible if they’re poor. That makes a Lola incident possible where the wealth of a country is controlled by the richest 1 percent over the remaining 99 percent. It’s like that in the Philippines. And it’s certainly true in America.